Tyson Fury’s future plans for Deontay Wilder and Anthony Joshua might not necessarily include fighting either of boxing’s heavyweight champions. A rematch with Wilder and an all-UK showdown with Joshua represent the two opportunities for Fury to make the most money in boxing. Still, the way the lineal heavyweight champ anticipates all this unfolding, he’ll be the last huge man standing once Wilder and Joshua beat one another into retirement. That could happen without Wilder or Joshua fighting him, according to what Fury told BT Sport in an interview released over the weekend. When asked about boxing Joshua, England’s Fury called the unbeaten British superstar “an even bigger dosser” than Wilder. Fury spent much of the buildup toward his controversial draw with Wilder on December 1 at Staples Center in Los Angeles calling Wilder “a dosser,” a disparaging British term for a person without a home or a job. 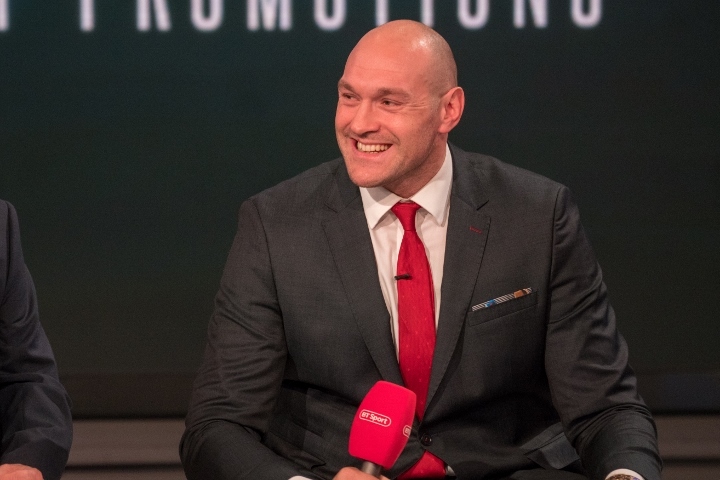 “I’ll tell you what I can do with them two, yeah?,” Fury told BT Sport. “I can give ‘em a job carrying my boots and bags. So, when they’ve all been busted, very soon, when they fight each other and knock lumps off each other and they get beat up and they lose and their careers [are] over, they can come to ‘The Gypsy King’ and I’ll employ ‘em. Because let’s face it – they’ve not got the most brains in the world. Fury’s facetious plans for Wilder and Joshua notwithstanding, each of these three unbeaten heavyweights will participate in fights that don’t involve one another over a four-week span during May and June. Wilder (40-0-1, 39 KOs), of Tuscaloosa, Alabama, is scheduled to make a mandatory defense of his WBC title against Dominic Breazeale (20-1, 18 KOs), of Eastvale, California, on May 18 at Barclays Center in Brooklyn. Showtime will televise Wilder-Breazeale. Two weeks later, Joshua (22-0, 21 KOs), of Watford, England, is set to defend his IBF, IBO, WBA and WBO crowns versus Brooklyn’s Jarrell Miller (23-0-1, 20 KOs). DAZN will stream Joshua-Miller on June 1 from Madison Square Garden in Manhattan. Another two weeks later, Fury (27-0-1, 19 KOs) and Germany’s Tom Schwarz (24-0, 16 KOs) are scheduled to square off in a 10-rounder. Their fight will be streamed by ESPN+ on June 15 from UNLV’s Thomas & Mack Center in Las Vegas. Tyson Fury is a very sharp witted person who has done some dumb things in his life. Once he retires from boxing he might have a great career in Hollywood (I'm serious). He has the persona and wit to succeed.